Posters pasted at various locations in downtown Toronto: arts district (Queen Street West), the gay district (Church Street), in a showcase box at the Art Gallery of Ontario and the Power Plant Gallery, posters covering a wall, overlooking the street, YYZ Gallery, a frieze of posters along a balcony in the lobby of the Macdonald Block (main government building) and on the façade of a building opposite. The original image posted on the AA Bronson Web site was part of the Imagevirus series, a project that was published in various art publications. A photograph representing the international poster campaign about AIDS is clearly featured in this image of the series. 1. Posters in the streets of New York City, San Francisco, Hartford and Atlanta (USA), Toronto (Canada), Tourcoing (France) and Berlin (Germany). 2. 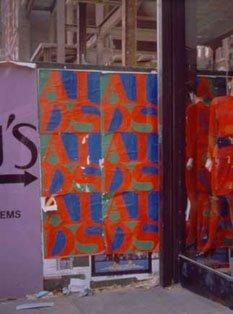 Project (posters installed in public places), launched in New York City in 1987. Hundreds of posters were installed in the streets of New York City, in November 1987, and San Francisco, in January 1988. Poster published by the Koury Wingate Gallery, New York, 1987. Printed signature (with copyright date of 1987). Silkscreen on paper: 684 x 685mm. 1,000 unnumbered copies, some signed. 3. Background: AIDS. Poster published by the Koury Wingate Gallery, New York, 1987. Printed signature (with copyright date of 1987). Silkscreen on paper: 762 x 762mm. 80 numbered and signed copies (produced in 1987, sgned in 1988). 4. Posters in two formats published by YYZ Artists' Outlet, Toronto. (A method of offset printing on paper, in two formats: 870 x 628mm and 593 x 596mm. Unknown number of copies, unnumbered, some signed). In 593 x 596mm format: printed signature (with copyright date of 1987). Thousands of posters installed in the streets of Toronto, May-June 1988 and subsequently in Berlin the same year. 6. The poster, created to raise money, was the first in a series of posters, pamphlets, lottery tickets and stickers. Published by Arbeitsgemeinschaft Deutsche AIDS-STIFTUNGEN (German foundation against AIDS), Germany. Offset printing process: 592 x 420mm. Unnumbered copies, some signed. Event: Fundraising from the Gewinnen und helfen lottery, Germany. 7. Background: A method of offset printing on adhesive paper: 160 x 160 mm. Unknown number of copies, some signed and dated (1990), unnumbered. Published by Arbeitsgemeinschaft Deutsche AIDS-STIFTUNGEN (German foundation against AIDS), Germany. General Idea designed the logo (red, black and yellow) of the foundation. This logo was used in the production of posters, leaflets, draft lottery tickets and stickers. 11. Poster designed for the German Foundation for AIDS. Published by Arbeitsgemeinschaft Deutsche AIDS-STIFTUNGEN (German foundation against AIDS), Germany (offset printing procedure: 840 x 590mm. Number of copies unknown, unsigned and unnumbered. 12. History: Poster with text, designed to raise money. Published by Arbeitsgemeinschaft Deutsche AIDS-STIFTUNGEN (German foundation against AIDS), Germany (offset printing procedure: 840 x 590mm. Number of copies unknown, unsigned and unnumbered. Event: Fundraising Art Against AIDS (art against AIDS), national action involving more than 100 galleries, Cologne, Germany. 13. Project for the Amsterdam tramway, sponsored by the Fodor Museum, Amsterdam. Published by Fodor Museum, Amsterdam (silkscreen on vinyl adhesive: 621 x 629mm. 60 signed and numbered copies). For tramways: unknown number of copies, unsigned, unnumbered. 14. Background: Order from the Seattle Arts Commission. Produced for the streetcar in Seattle as part of a public art project. Published by the Seattle Arts Commission, Seattle (silkscreen on vinyl adhesive: 610 x 2,235mm). About 100 copies, unsigned and unnumbered. 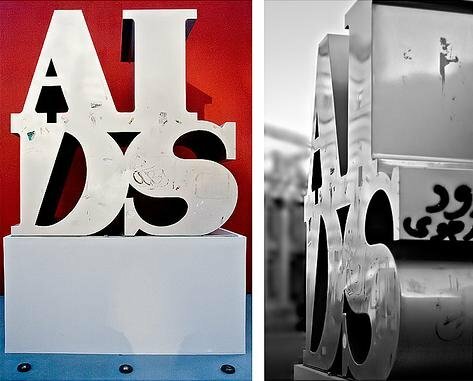 As part of the AIDS project, General Idea produced a myriad of events in a dozen North-American and European cities, both in galleries and museums as well as in public places. This project took on very diversified forms, including posters (silkscreen prints and offset prints) installed in public places and elsewhere, but also various paper media (stickers, stamps, flyers, cardboards, wallpaper, lottery tickets and even the cover of The Journal of the American Medical Association, vol. 268, no. 4, 22-29, July 1992), jewelry (rings), clothes (scarves and t-shirts), paintings and sculptures. Prints were produced from many of these objects. Pseudonyms and names of General Idea artists: o	Pseudonym: AA Bronson. Name: Michael Tims, born in Vancouver, British-Columbia, Canada (1946-). o	Pseudonym: Felix Partz. Name: Ronald Gabe, born in Winnipeg, Manitoba, Canada, (1945-1994). o Pseudonym: Jorge Zontal. Name: Slobodan Saia-Levy, born in Parma, Italy, (1944-1994).